Ultimate multimedia experience with Tagital T10 Plus 10.1 inch Octa Core Tablet PC: Featuring the latest Octa Core CPU and Google Android 5.1 Lollipop OS, Tagital latest model T10 Plus ensures an extraordinary smooth gaming and ultimate multimedia experience. The ultrafast and powerful A83T processor allows quick app launches and fluid graphics. A83T Octa Core Processor: A83T processor comes with 8 Cortex-A7 Cores that runs up to 2.0 GHz and a high-speed PowerVR Series5 GPU architecture. To minimize its power consumption, A83T is equipped with the incredibly power-efficient Cortex-A7 CPU architecture and the performance – power balanced GPU and integrated a wide range of interfaces and connectivity. Endless entertainment and incredible 3D gaming experience: With 1 GB RAM and A83T processor, you can download all your favorite applications seamlessly. Built-in Bluetooth 4.0 enables easy pairing with speakers, keyboard, and game controller, etc. With HDMI (HD Multimedia Interface), you can easily connect your Tablet to just about any TV and start streaming your favorite content and turns your game playing a much more fulfilling experience. 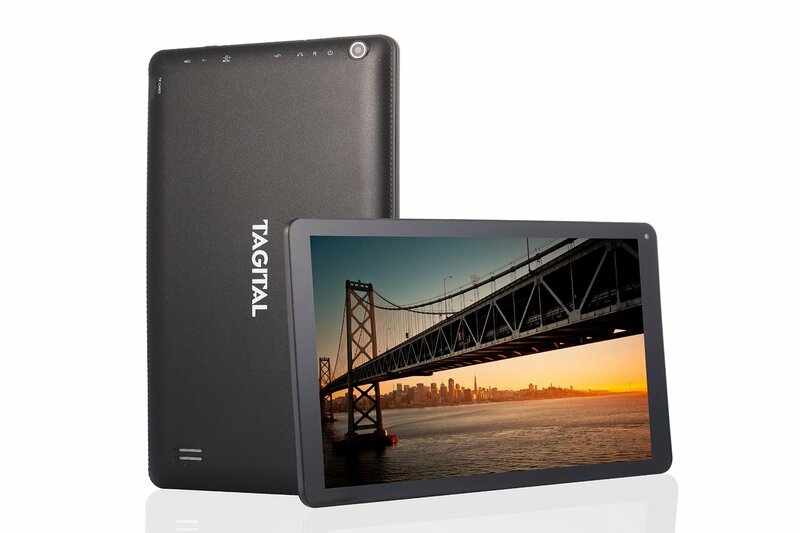 Incredible Gaming Experience: Perfect for playing games, browsing the web, or watching movies or videos, the Tagital T10 Plus features a 10-inch Tablet widescreen, so you experience rich graphics, vivid colors, and crisp text that turn game playing, moving watching and web browsing a much more pleasurable experience. 1 GB RAM and 16 GB storage enables you to download your whole favorite applications from Google Play Store without lagging. Stunning display: With wide viewing angles up to 160 degrees and 10.1-inch screen, the Tagital T10 Plus Tablet is great for watching movies or videos, playing games or reading ebooks. A83T Octa Core integrates Allwinner next-gen SmartColor display technology that delivers higher picture quality and better visual effects. The clear and vivid color and stunning display enable you to experience rich and bright graphics and crisp text. Distinctive power-saving design: With Cortex-A7 CPU architecture and the performance power balanced GPU, Tagital T10 Plus 10-inch Tablet consumes much less power than most Quad-Core Tablets and the power-saving design allows extended battery life. Local supported customer service: Tagital offers 1-year manufacturer defect warranty. Also, our U.S-based local customer service and technical support ensure quick response to your questions through email and local phone call. Feel free to contact us whenever a question pops up in your head, we are always here to help. Guaranteed Satisfaction: Long-Term commitment from Tagital – U.S based customer service, technical support, and 1-year limited manufacturer defect warranty guarantee 100% satisfaction.